Inspiration from the Ground Up. Digital Printing’s Role in Commercial Flooring . 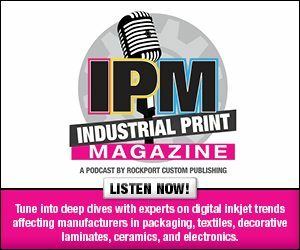 Manufacturers consider implementing digital printing technology to broaden their product portfolios in innovative ways and heighten efficiency throughout the manufacturing process. Digital printing offers flexibility whether it be in choosing a specific color, working with a customized pattern, or meeting a quick turnaround. One industry that benefits tremendously from digital printing is the flooring market. According to a 2017 report from Grand View Research, Inc., the commercial flooring market is expected to reach approximately USD 47.69 billion by 2025. The same report, Commercial Flooring Market Analysis By Product (Soft Coverings, Resilient, Non-resilient, Seamless, Wood & Laminates), By Application, By Region, And Segment Forecasts, 2018 – 2025, explains that the resilient flooring industry in particular is expected to show substantial growth over the next eight years due to several benefits including cost effectiveness, easy installation, and low maintenance. Grand View considers luxury vinyl tile (LVT), vinyl composite tile, vinyl sheets, fiberglass, and linoleum as resilient flooring. All are prime candidates for digital decoration. Above: A recent partnership with the Raleigh News & Observer occurred thanks to Tarkett’s Collection Infinies product line. With its worldwide headquarters in Paris, France, Tarkett is an innovative flooring and sports surface solutions provider for hospitals, schools, housing, hotels, offices, stores, and sports fields. Celebrating over 130 years of flooring experience, it offers a range of products including vinyl, linoleum, carpet, rubber, wood, laminate, synthetic turf, and athletic tracks. Major brands under the company’s corporate umbrella are found in over 100 countries and include Beynon, Desso, FieldTurf, Johnsonite, Tandus Centiva, Tarkett, and Tarkett Sports. In 2010, adapting digital printing into the manufacturing process was pursued on a global level through the organization’s senior leadership team. There was a particular focus on LVT. According to Wright, the project began with a research and innovation group, and broadened to a cross-functional team as they made progress with the technology. “The flooring industry was utilizing digital printing on other types of surfaces, but no one had digitally printed LVT,” she admits. Identifying the benefits of digital printing early on, Wright says the Tarkett team hoped to meet goals focused on sustainability, quality/inventory control, shorter turnaround times for customized projects, and visual design. First, as part of its Doing Good. Together. message, the company looked to achieve specific sustainability goals to reduce or eliminate the use of chemicals in the manufacturing process. “Our traditional print film processes used a solvent-based ink system, which was necessary to adhere the film to the vinyl substrate. Part of the initiative to move to digital printing included the development of a new water-based ink system, as well as a new substrate,” explains Wright. Secondly, the company hoped digital printing would improve its quality and inventory control. “It would allow us to produce these LVT products entirely in house without relying on outside vendors for print films. Our inventory control would also be streamlined because we would only have to inventory raw materials. This vertical integration would give us a more streamlined business over all,” she shares. With customized flooring a growing trend, Tarkett knew it needed the flexibility to create these types of products on demand without long lead times, high minimum order requirements, or the need to work with external suppliers. Digital printing makes this a reality. “This has completely changed the conversation with our customers regarding customization. As a society, we are accustomed to getting products exactly to our personal specifications, and it’s easier to do that now with our building products,” says Wright. Design-wise Tarkett also looked for a level of flexibility it wasn’t able to achieve with other printing methods. “From a visual design perspective, digital printing allows us to create patterns that are not limited to a pattern repeat. We’re also able to achieve a broader range of color, as well as an authentic, realistic appearance for wood and stone designs,” adds Wright. Today, Tarkett’s North American location in OH houses its digital printer in a 5,000 square feet building. It is also home to design team offices and collaboration areas. While the printer is an out-of-the-box device, according to Wright, it underwent modifications to meet Tarkett’s specific needs, thus rendering it proprietary technology. Like any piece of equipment Wright admits there was a learning curve for both the design and operation teams. While neither had an existing pool of knowledge to cull information from, trial and error was the mode of choice when learning how to use the printer. Rotogravure printing is still utilized for existing product lines as the technology is relevant and cost effective for certain industry staples offered by Tarkett. However, the company continues to launch and evolve new designs that rely on digital printing technology with the goal of almost transitioning completely to this design and manufacturing process in the future. For example, its Color Play line is based off of Tarkett’s latest research for healthcare and education spaces. According to the company’s website, the collection includes three mix-and-match patterns in 24 colors. All are available in 6×36-, 9×36-, and 18×18-inch sizes. Each high-definition visual is digitally printed to provide more authentic detail, longer pattern repeats, and endless opportunities for customization. According to the company, the product is offered at one of the lowest minimum order quantities in the industry. It provides quick and easy sample re-coloring and approval. Besides the Color Play collection, other product portfolios utilizing digital printing at Tarkett include Broadcloth, Faux Bois, Outliners, and Illusion, which are developed on its Contour LVT substrate, in collaboration with designers Suzanne Tick, Manuel Navarro, Jhane Barnes, and Jane Hallinan, respectively. While commercial designs on a larger scale are possible with digital printing, more boutique and custom work is also an option. A recent partnership with the Raleigh News & Observer occurred thanks to Tarkett’s Collection Infinies product line. Collection Infinies combines digital printing with LVT for extended pattern repeats, creating a portfolio of high-end designs with expansive, randomized flooring motifs and enhanced realism, per Tarkett’s website. Collection Infinies addressed the newspaper’s need for design elements that carried specific meaning to it and spoke to its history and service to the community. The LVT created for the Raleigh News & Observer—and designed by iS Design—displays standout news stories published throughout the paper’s history. “The flooring became a significant reminder of the organization’s rich history, as it evolves into a digitally oriented 24/7 media company,” shares Wright. While each customized product’s timeframe is dependent on a number of variables, Wright says custom LVT generally takes about eight weeks from initial concept to delivery of final product. The process includes pattern conception, customer approvals, final layout of the pattern, a trial production run, production, and delivery. “A consistent challenge with any custom work is making sure we have legal permission to reproduce the images provided. This particular project stands out because of the crispness of the images. People are able to read these old news articles right off the floor. Some of the news stories date back to World War II,” adds Wright. Digital decoration is changing flooring as we know it—expanding options when it comes to design. “We have more patterns and color options because we’re printing on demand. We’re able to change or customize a product, allowing LVT to become more of an integral part of the whole design scheme in a commercial environment. The entire inspiration for a space can start with the floor. This broader range also makes it easier to select flooring that works with the other finishes in a space. All-around design flexibility is a huge win for designers and clients,” concludes Wright.